That’s an old French expression meaning that if two things happen then inevitably a third will follow. It was the unlikely situation the Canadian team found itself in on day one of the Fed Cup World Group II Playoff against Ukraine being held at Stade IGA in Montreal. The first of the three dominos to fall was when opening-match singles player Francoise Abanda took a tumble while doing some warm-up exercises minutes before she was to walk out with her teammates for the ceremonial introductions and gift giving that are part of Fed Cup and Davis Cup tradition. In the picture above, Abanda, dressed in white, is standing with the other members of the Canadian squad getting ready to the walk out on court. In the fall Abanda injured her face in the area of the orbital bone around her eye. That required that Bianca Andreescu immediately get prepared to play and she was on court and ready to go within about 15 minutes. The 17-year-old from Mississauga, Ont., played impressively and actually led the match against No. 41-ranked Lesia Tsurenko 6-4, 3-1. Ranked No. 197, Andreescu was clearly the more offensive-minded and heavy-hitting player on the court. But gradually she lost a bit of her edge and the 28-year-old Ukrainian steadied to take the second 6-3 and gradually pull away in the final set. Trailing 4-0, Andreescu went down in obvious pain near the baseline and was soon being cared for by captain Sylvain Bruneau and others on the Canadian team staff. It was a cramping problem in her right leg and it spread elsewhere. She was in pain and soon in tears. The final score read 4-6, 6-3, 4-0 ret. for Tsurenko. With two players infirm, what were the chances that the third playing on Saturday, Genie Bouchard, would join them? As unlikely as it sounds, she did …well almost. Streaking in partly sideways close to net as she hit a winning backhand passing shot to break her opponent, Kateryna Bondarenko, and lead 3-2 in the opening set, Bouchard went off the court and collided with what has variously been called “a towel stand” or a “towel rack.” She took a couple of pills at the ensuing change-over and seemed to be fine the rest of the way as she completed a solid performance to beat the No. 78-ranked Ukrainian 6-2, 7-5. After the match Bouchard revealed that she had hurt the base of the palm on her left (two-handed backhand) hand as she put it out put to protect herself. She and Bruneau joked about the seriousness of it afterwards, with the captain absolutely beside himself faced with the possibility that yet a third player on the team, and on the day, had hurt themselves. All the medical talk somewhat overshadowed the fine match Bouchard played to beat Bondarenko (above), which was something of a seesaw affair with the Ukrainian running hot and cold and especially cold on service. She had 13 double faults to just three for Bouchard. From the start against Bondarenko, Bouchard was sharper than her opponent – forcing her to deuce three times in her opening service game and to deuce four times the second time the Ukrainian served. After winning eight of nine points in her own first two service games, Bouchard broke and took control of the set with measured but decidedly aggressive pounding off the ground. She was timing the ball well. In the second set, there was dip and a third set seemed likely as Bondarenko served at 40-love and ahead 3-1. But Bouchard boomed a huge serve return winner to begin to turn the tide, and won the next four points to break serve. There were some nervous moments for the rest of the set until Bouchard served out the match with three big serves – each close to 180 km/hr, the last one followed by a winning forehand. After a wild and wacky day with injury and misfortune befalling the Canadians, the line-up for Sunday’s two singles, followed by a possible tie-deciding doubles match, is very much up in the air. He added that Gabriela Dabrowski, the world No. 10 in doubles but ranked only No. 364 in singles, and with a 0-2 Fed Cup singles record, would be ready to step in if needed in singles on Sunday. Sunday’s first match is slated to be Bouchard vs. Tsurenko. The two have met twice before – Tsurenko won in Indian Wells in 2015 and Bouchard prevailed in Kiev in Fed Cup Group II action in 2013. That’s to be followed by Abanda or Andresscu (pictured above) or Dabrowski against Bondarenko. If the best-of-five match tie came down to the doubles, the Ukrainians, with Bondarenko ranked No. 56 and No. 50-ranked Olga Savchuk, would likely be favoured. They’ve won six Fed Cup doubles matches in a row together and Bondarenko is an immaculate 12-0 in her career Fed Cup doubles. 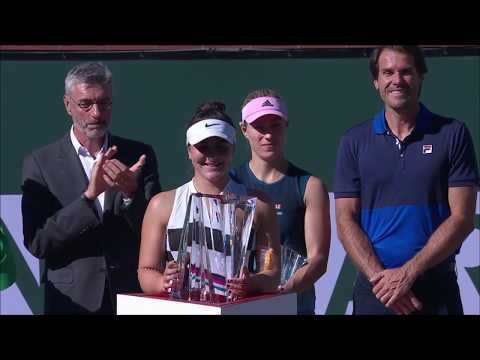 As for Canada, Dabrowski, who currently holds the mixed doubles titles at both the French and Australian Opens, will be the anchor – with Bouchard (No. 119 in doubles) and Andreescu (No. 160) being more viable options than Abanda with her No. 1316 doubles ranking. Ironically, some of the talk leading into the World Group II Playoff in Montreal was about the Ukrainians bringing only three players and really having just Tsurenko and Bondarenko as viable singles options because the 30-year-old Savchuk is ranked No. 867 in singles and not considered much of a threat. Canada is world-renowned for its maple syrup. In Quebec especially, the locals make tarte au sucre (sugar pie) from maple syrup and some of these could be seen in the foreground of this display at the Marché Jean Talon on Saturday morning. Apr 23, 2018 Tebbutt: What a weekend!